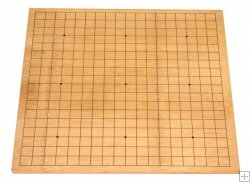 Reversible bamboo go game board, 19 x 19 and 13x13 board on reverse side. Size: 44 x 47 x 1 cm. Excellent ratio quality / price. The ideal board for beginners. Minimal order quanity: 1 carton (20 pieces).